The hippocampus is found in the temporal lobe below the cerebral cortex. There are two hippocampi, one in each cerebral hemisphere. Its name comes from the Greek for "seahorse" because when it is removed from the brain, it resembles the equine fish (see picture below). What is the hippocampus and what does it do? 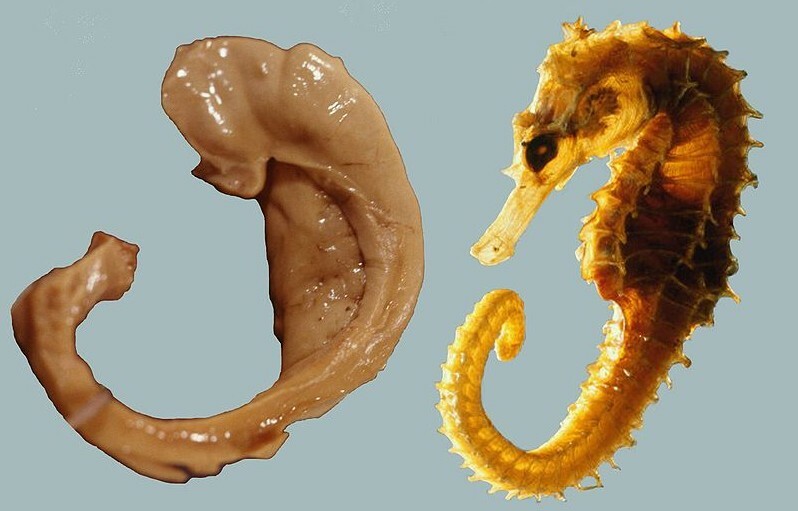 Hippocampus removed from the brain (left), in comparison to a seahorse. The term "hippocampus" comes from the Greek for seahorse. credit lazlo seress. The hippocampus is a brain structure thought have a critical role in memory. Although suspected to be involved in memory for some time, the importance of the hippocampus in this respect was solidified in the twentieth century by the case of a patient named Henry Molaison. Molaison, who was known simply as H.M. until his death in 2008 (to protect his identity while he was alive), underwent surgery to treat severe epilepsy in his late twenties. In that surgery, much of his hippocampi were either removed or damaged. The surgery was successful in controlling Molaison's seizures, but afterwards he suffered from severe anterograde amnesia, meaning that his ability to form new memories was impaired. In fact, Molaison was completely unable to form new explicit memories (memories that involve conscious recollection of facts or experiences). Molaison retained some memories from before the surgery, although memories that were closer in time to his surgery were less stable, and his procedural memory (memory for non-conscious procedures like using a fork or riding a bike) was still functional. But due to his implicit memory deficits, Molaison was forced to live entirely in the present; each day brought with it no recollection of the day before. Another patient, Clive Wearing, who experienced hippocampal damage after suffering from encephalitis, is living with a deficit very similar to Molaison's. He is only able to retain information for about 30 seconds before it disappears, but he can still utilize procedural memory to do things like play the piano (see the video below). 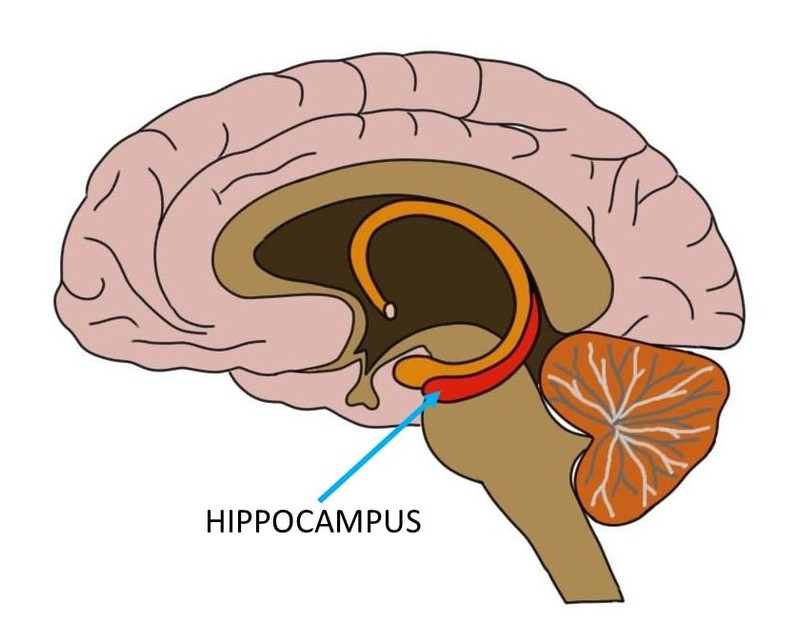 Thus, the hippocampus is thought to be a crucial structure in memory consolidation (the formation of new memories). It is also important in memory storage, although it is thought that this is accomplished through the recruitment of other areas of the brain as well. The hippocampus is one of the brain regions most affected by Alzheimer's disease, a debilitating illness that is characterized by severe memory loss. In Alzheimer's disease, neurons of the hippocampus are killed off, and this neuronal death is associated with symptoms of dementia. The hippocampus is also thought to be important to spatial navigation and orientation. It has been hypothesized that neurons in the hippocampus encode information about our environment in such a way that they create a cognitive map of our surroundings. One well-known study investigated this hypothesis by looking at the brains of a group who are required to have refined navigation skills: cab drivers in London. Researchers used MRI to compare the size of the hippocampi in London cabbies to the size of the hippocampi in control subjects. They found that the cab drivers had increased grey matter volume in the hippocampi, suggesting that perhaps the cabbies had formed a larger number of neuronal connections in creating a more complex cognitive map in their hippocampi. The hippocampus has many other roles beyond memory and navigation. For example, reduced hippocampal volume has been seen in depressed patients (read more here) and those suffering from post-traumatic stress disorder; it is thought that the stress experienced by patients who suffer from these disorders may be especially damaging to hippocampal neurons. But memory remains the function most associated with the hippocampus, in part due to the notoriety of the fascinating case of H.M.